this morning to remove the abscess. live out her last days in the hospital. miss our ornery dog very much. I’m so sorry. She looks like a beautiful pup. My little girl and I are sad to see a member of your family pass away. I’m glad the end was peaceful. Wow she looks stunning -almost like a lion! So sorry for your loss. I am so sorry. I had to put my 15 year old chocolate lab down last spring- he died in my arms and I thought part of me died with him. My thoughts are with your family. oh, man, vero. I’m so sorry. I think you made a good choice, but a hard one. I hope your family is doing well and blessed with the peace of wonderful memories tonight. xo. I’m so very sorry for your loss. She’s a beautiful dog and looks so happy in this picture. Wishing you peace and comfort. I’m sorry — many hugs. Badger’s Parting Gifts and Life Cycles. I’m sorry you lost your dog. This is my first visit to your blog and I just had to post a reply to this. I’m sorry that you lost a member of your pack-the photo of her is beautiful. 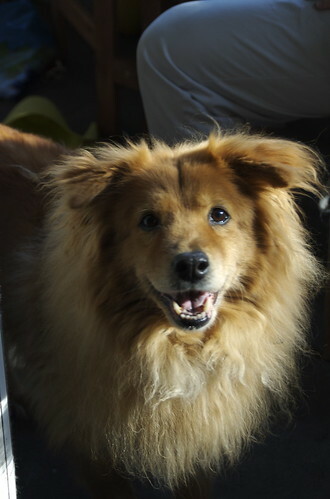 We lost our sweet dog a few years ago, and know how hard it can be. Best wishes.